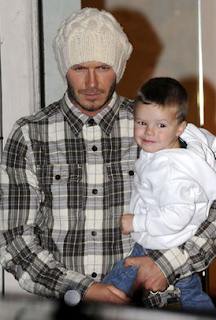 David Beckham appears to be trying to start a new trend with the oversized hat he is wearing while out with youngest son, Cruz, 2. David and Victoria Beckham (not shown), visited the the Winter Wonderland Ice Rink in Hyde Park, London last night.The kids strapped on some skates and zipped around the ice as mom and dad looked on. It was cute to see David give his son Romeo a high-five after completing his first lap.